"Perfect as a luxury surfers retreat or for the family that just wants to relax and stay right near the surf, sunsets, and pure serenity of Playa Guiones, our brand new villas were just completed in December of 2016. 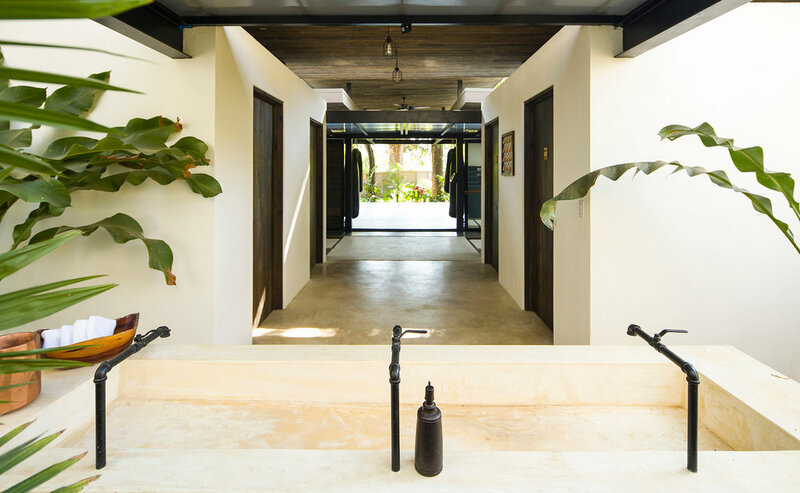 As you come in from surf or play at the beach, you can rinse off at the outdoor shower next to your own private saltwater pool. And the kitchens are ready with Ninja blenders to make smoothies with fresh coconut water and local fruits that you can pick up at the nearby markets. The Villas come with bed linens, bath and beach towels. Spa bathrooms are set up so you can enjoy an indoor or outdoor shower to really get that sand out. Plenty of decks outside the kitchen and living room area, as well as every bedroom to enjoy your time outside lounging with your favorite book. The front door. It may sound strange, but we loved the massive wood pivoting front door to the villa. The door was always welcoming, and a pure joy to open. The shower. Each shower has it’s own small private outdoor garden. Unexpected and spectacular! The glass window-walls. We opened the expansive glass window-walls (located in the main living area and each bedroom) when arrived and didn’t close them for a week. It felt like we were living outdoors and we especially loved it when it rained. Modernism, in a jungle. The crisp white villas were a perfect foil the lush, wild landscape and dirt roads of Nosara. The private pool. What else is there to say? Pure luxury! The location. World-class surfing, yoga, and organic restaurants were an easy walk away. There was even a beautiful outdoor gym on-site (with classes!) and a skate park right across the street.